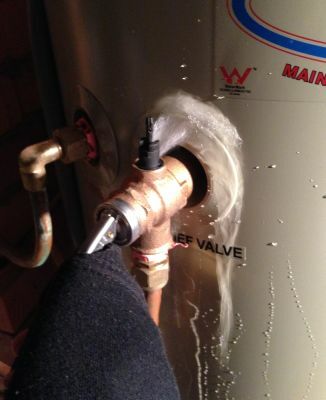 So you know how we had our hot water tank replaced last year? Well they say you need to test the relief valve every six months. So I've been testing it every three months for good measure. But the other day when I went to test it, hot water started spurting everywhere. Apparently it's coming out of the snifter valve. So now I need to call up Aquamax for a warranty repair (and hope warranty doesn't expire after 12 months, cause now it's a little over). Hurrah. And also the other day I was in the dungeon and happened to notice a spot on the roof in the corner. 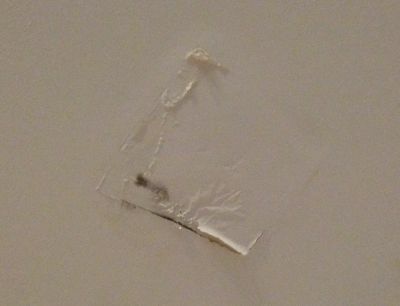 Had a closer look and it looks like there's water damage. It's right under the shower drain, and the pattern of damage looks like that little bit of roof has been replaced before, which means the shower has likely leaked before. It seems to only leak when there's a lot of water draining (ie, when Stu is having a shower, as he showers with higher water pressure). I've got a bucket under there at the moment catching the drips, but now we'll need to get someone to dig a hole in the roof and have a look. Hurrah. Not good news on the plumbing front. Hope the issues can be fixed without too many hassles.